(Nanowerk News) Though scientists argue that the emerging technology of spintronics may trump conventional electronics for building the next generation of faster, smaller, more efficient computers and high-tech devices, no one has actually seen the spin—a quantum mechanical property of electrons—in individual atoms until now. In a study published as an Advance Online Publication in the journal Nature Nanotechnology on Sunday, physicists at Ohio University and the University of Hamburg in Germany present the first images of spin in action. The researchers used a custom-built microscope with an iron-coated tip to manipulate cobalt atoms on a plate of manganese. Through scanning tunneling microscopy, the team repositioned individual cobalt atoms on a surface that changed the direction of the electrons' spin. Images captured by the scientists showed that the atoms appeared as a single protrusion if the spin direction was upward, and as double protrusions with equal heights when the spin direction was downward. The different shape and appearance of these individual cobalt atoms is caused by the different spin directions. The study suggests that scientists can observe and manipulate spin, a finding that may impact future development of nanoscale magnetic storage, quantum computers and spintronic devices. "Different directions in spin can mean different states for data storage," said Saw-Wai Hla, an associate professor of physics and astronomy in Ohio University's Nanoscale and Quantum Phenomena Institute and one of the primary investigators on the study. "The memory devices of current computers involve tens of thousands of atoms. In the future, we may be able to use one atom and change the power of the computer by the thousands." Unlike electronic devices, which give off heat, spintronic-based devices are expected to experience less power dissipation. The experiments were conducted in an ultra-high vacuum at the low temperature of 10 Kelvin, with the use of liquid helium. Researchers will need to observe the phenomenon at room temperature before it can be used in computer hard drives. But the new study suggests a path to that application, said study lead author Andre Kubetzka of the University of Hamburg. To image spin direction, the team not only used a new technique but also a manganese surface with a spin that, in turn, allowed the scientists to manipulate the spin of the cobalt atoms under study. "The combination of atom manipulation and spin sensitivity gives a new perspective of constructing atomic-scale structures and investigating their magnetic properties," Kubetzka said. The research, which was carried out at the University of Hamburg, was supported by the German Research Foundation and a Partnership for International Collaboration and Education (PIRE) grant from National Science Foundation. 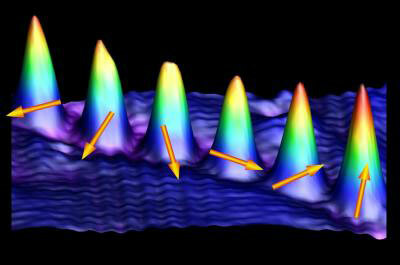 The research is the result of a collaboration among three research teams: a spin-polarized scanning tunneling microscopy group of Professor Roland Wiesendanger led by Kubetzka at the University of Hamburg, Germany; Hla, an expert in atom manipulation at Ohio University; and two theorists, Professor Stefan Heinze and Paolo Ferriani, now at the Christian-Albrechts-Universität Kiel, in Germany.